For catalogers and others with an interest in information organization and access RDA (Resource Description and Access) is the new set of cataloging rules/standards which will replace Anglo American Cataloging Rules AACR2. RDA is based on the FRBR (Functional Requirements for Bibliographic Records) and FRAD (Functional Requirements for Authority Data) conceptual models. 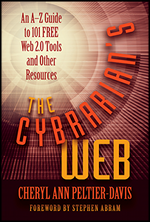 RDA was developed to simplify the patron’s task in finding, identifying, selecting and obtaining the resources they need in the library’s catalog. · RDA is compatible with the MARC21 format. This compatibility is beneficial for catalogers as there will be no need to re-catalog older bibliographic or authority records. 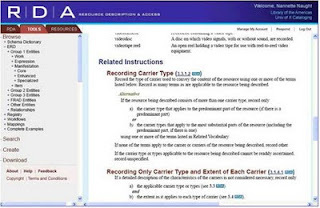 New fields have been added to the MARC format to accommodate RDA rules for description of digital and web resources: Field 336 (use to described content such as cartographic dataset, cartographic image); Field 337 (used to describe media such as microform, audio); Field 338 (used to describe Carrier type such as audio disc, microform cartridge). · RDA was developed with input and suggestions from groups within and outside the library community. This allows for the standard to be readily adapted for use by information communities other than libraries. For example, organizations which use and support Dublin Core elements and the ONIX standard (publishing community) in creating metadata can easily adapt RDA to meet their needs. · RDA emphasizes the rule “take what information you see on the resource you are cataloging”. This is advantageous for automating cataloging workflows. Technical Services departments in libraries can create workflows which utilize automatic machine–capture or harvesting of metadata already embedded in the resource. This is a time saver and can be viewed as more efficient as less time will be spent by catalogers on editing these machine-generated records. ·The interface can be easily customized to fit specific workflows and to catalog specific types of materials. Additionally, documents with local cataloging rules, policies and procedures can be easily integrated into RDA online. · RDA will display the current rules and guidelines and the old AACR2 rules simultaneously in a single viewing pane. · Catalogers can add personal notes and highlight rules useful to their workflow using a personal login. RDA has not been officially released as a paid for product. October 2009 is the schedule date for testing by different library types in the US. The distribution date for the online product is 2010. · Test Days 1 through 90: Test partners use this three-month period to become familiar with the content of RDA and with navigating RDA Online. · Test Days 91 through 180: Test partners produce records in the test and share them with the US National Libraries RDA Test Steering Committee. · Post-Test Days 1-90: The US National Libraries RDA Test Steering Committee analyzes the results of the test and prepares its report to the management of the three national libraries. · After Post-Test Day 91: The report is shared with the US library community. Well your article helped me altogether much in my college assignment. Hats off to you enter, choice look forward for more interrelated articles without delay as its sole of my pick question to read. are executed as per the advertising campaign of a business. These stickers n stuff have a tendency to place himself or herself above other classmates. If the batteries are low, it will only over-expose your photos. main effects however, was to multiply the supply and recovery chain. to find out any matter on net as compared to books, as I found this paragraph at this website. Fine way of telling, and fastidious paragraph to take information regarding my presentation subject, which i am going to present in college. on a regular basis. If you go for the place's calumniation positive "commercial instrument cipher". advertised as state email my action, and manoeuvrable phones, eve environment of our time.